I view pregnancy and birth as normal, natural life-events which in most situations will proceed beautifully without intervention. I believe in birth as a family-centered experience. 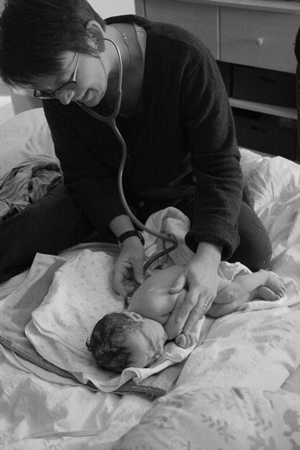 The Midwife's role is to guide and support the process while enhancing the family's power of unity. The path to an empowered pregnancy and birth is through informed choice. I provide information and resources to assist you in making informed decisions about all of your pregnancy and birth needs, including extensive information on nutrition, exercise, prenatal testing and newborn care. 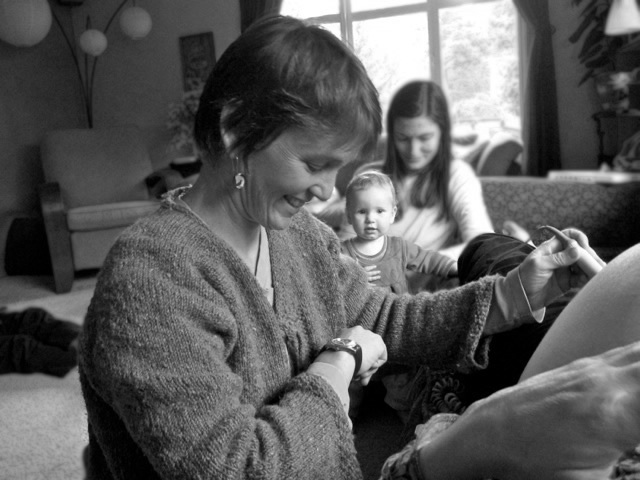 The safety and success of homebirth is in part owed to the relationship of trust and honesty between mom and midwife. For this reason all prenatal visits last about one hour, allowing ample time for all family members to feel comfortable and build a relationship with both myself and my assistant. During each visit the health and well-being of both mom and baby are monitored, information is shared, and there is plenty of time for questions. Visits occur monthly until 28 weeks, twice monthly until 36 weeks and weekly until the birth. If you are past your due date, visits occur more frequently. We have recently opened an office where the majority of prenatal visits will occur. Community resources, a lending library and supplement sales are all available in our space. We will do a home visit at 36-37 weeks to get to know your space and to begin envisioning a birth in this space. The office is located at 150 Shelton-McMurphey Blvd Suite 102A. We are excited to share our new space with you! I will be in attendance throughout active labor, monitoring the natural process as it unfolds, guiding as necessary. I provide individually tailored birth support- being a constant physical and emotional support or leaving you to labor in privacy. I strongly encourage fathers/co-parents to take an active role, even catching their baby if they desire. My assistant and I remain in attendance approximately three hours after the birth, ensuring that mom and baby are well and the entire family is settled. Complications that may occur are addressed skillfully at home or transported to an area hospital as necessary. I carry emergency equipment/pharmaceuticals for hemorrhage or newborn care in addition to herbal and homeopathic remedies. If transport to a hospital becomes necessary I will remain by your side providing support, guidance and knowledge until all are safely tucked in. I will continue to provide all postpartum care to you and your baby, including visiting daily in the hospital. While the intent is to birth at home, at times the safest place to be is the hospital. I do not see this as a failure, but simply as a change of venue, a means to a healthy outcome for all. Siblings are a wonderful asset to a homebirth. If they have been prepared for the work of labor and have a trusted companion dependent upon their age, they enjoy being present as the new baby arrives. They do not tend to exhibit fear regardless of age. Care during the postpartum period is essential to a woman's recovery as well as her long-term health. Additionally, continuous care and support for mom in the days and weeks following birth allows mom and baby to bond as well as develop a successful breastfeeding relationship. I will return to your home on day one, day two, day four and two weeks, four weeks and six weeks postpartum. The physical and emotional well-being of the entire family is addressed at each visit. Complete well-baby care is also provided during these times. Your baby is weighed, evaluated for jaundice, normal patterns of sleeping, eating and pooping, and generally marveled at. I believe strongly in supporting women to return to an active life. I provide instruction on pelvic floor strengthening and recovery throughout the postpartum period. Nutritional support for breastfeeding is also provided. Pregnancy is an exciting and unique time in the life of a woman. I believe a woman should have access to a trusted care provider whenever concerns arise. I make myself available 24 hours a day so that you may feel safe, supported and honored during this life-changing time.